An exceptional grey schist figure of a Bodhisattva, his face moustached and handsome, his long hair spilling over his shoulders and gathered beneath an elaborate turban, wearing intricate and extensive jewellery and a lower garment supported by a twisted cord around the waist, with a long scarf wrapped around and under the left arm. 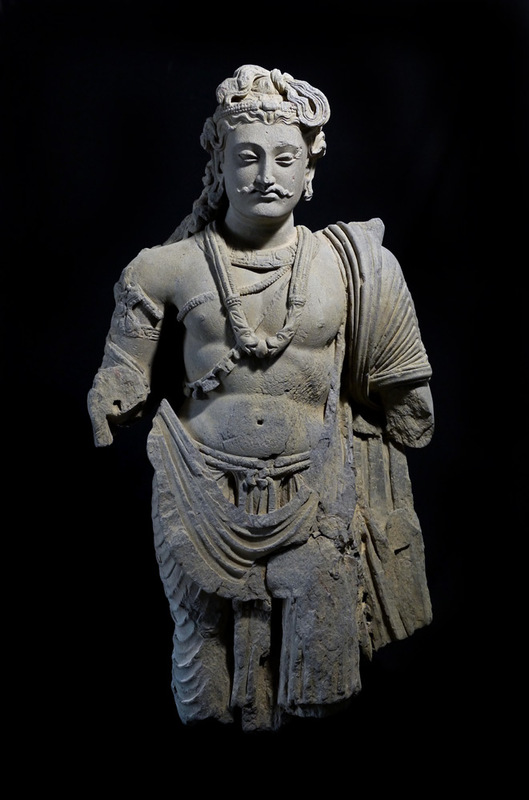 This figure is dressed in the attire and adornments of Kushan royalty. For a group of similar Bodhisattvas, please see nos. 105-109 in Isao Kurita, 2003.